As a user of a powerful email program like Mozilla Thunderbird, you need to use at least some of the keyboard shortcuts. There tens of Thunderbird shorcuts but just have look at this list to find if features you frequently use has a shortcut key. It probably have. To start a new message in non-default format (Plain text vs. HTML): Hold Shift while clicking any one of these buttons: Write, Reply, Reply All, Reply List, or Forward or Right-click existing message, then hold Shift while choosing any one of the following from the context menu: Reply to Sender Only, Reply to All, Reply to List, or Forward. To select multiple non-adjacent messages (several separate messages), select any message of your intended selection, and then either Ctrl + Click on each message that you want to add to your selection or hold Ctrl while using any of the movement keys listed below and then pressing Space on each message that you want to add to your selection. The movement keys are Up arrow, Down arrow, Page Down, Page Up, End, or Home. Most of the common keyboard shortcuts for controlling a Thunderbird window can also be used in the compose window. 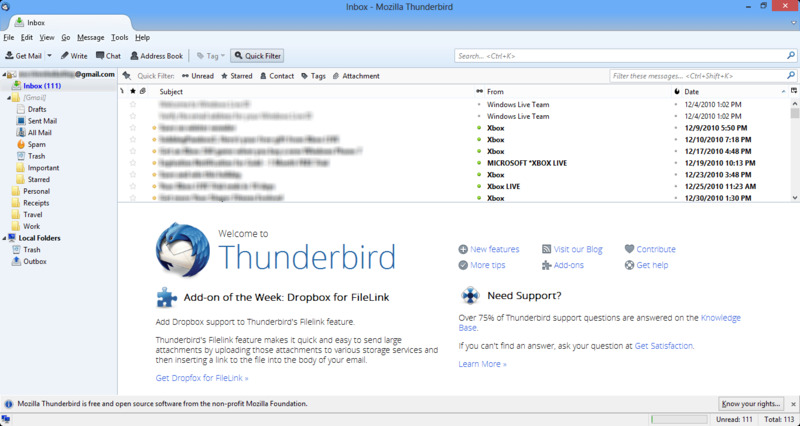 Thunderbird is free, cross-platform, easy to use email client from Mozilla. What is your favorite Mozilla Thunderbird hotkey? Do you have any useful tips for program? Let other users know below. What;s the shortcut for minimize ThunderBird??? Thanks a lot Zeynel, thanks to your handy list I'm now learning additional ones.